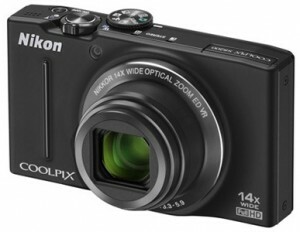 Ultra-portable 14x super-zoom: boasts a compact pocket-size body. Back illuminated 16 megapixel CMOS image sensor: increases the amount of light that each pixel receives, improving sensitivity and reducing noise for superb performance in any light. 14x NIKKOR zoom lens with wide-angle to super-telephoto coverage: boasts ED (Extra-low Dispersion) glass as well as aspherical lens and HRI (High Refractive Index) elements for superior performance. Offers outstanding precision and sharp resolution (35mm equivalent: 25-350 mm). Anti-blur technology automatically counters blurred images in four different ways. Lens-shift VR (Vibration Reduction) reduces the effect of camera shake. High ISO (up to 3200) light sensitivity reduces the risk of blurred images with fast-moving subjects or in low-light. Best Shot Selector (BSS) automatically selects the sharpest of up to 10 sequential shots. Dedicated light modes: deliver superb results in any light, even without a tripod: Backlight scene mode with Auto HDR offers impressive tonal detail in any situation. Night Portrait mode delivers beautifully detailed night scenes and indoor portraits. Night Landscape mode lets you shoot sharp images in low light. Large 7.5 cm (3 in.) 921k-dot LCD monitor offers vivid color reproduction, sharp contrast and clear viewing. Boasts Nikon’s Clear Color Display technology that minimizes reflections, even in bright sunlight. Full HD (1080p) movie recording with stereo sound: optical zoom and autofocus are available during recording, and you can capture a photo while filming. Boasts an option to film in slow or fast motion using recording speeds from 15 to 120 fps (VGA). Camera features a built-in HDMI connector with HDMI-CEC support for output to an HDTV. High speed continuous shooting: lets you capture the action at a fast 6 fps. Quick response: fast start-up and autofocus for capturing moments as they happen. Easy Panorama 360°/180°: lets you pan vertically or horizontally to create dynamic panoramas. Special effects: shoot still images or movies using a special effect, or use an in-camera filter to enhance photos after you have taken them. Effects to shoot with include soft focus and Nostalgic Sepia, and you can review your choice on the LCD screen before you begin. Filters include Cross Screen, fisheye and Miniature. EXPEED C2 image processing system provides enhanced movie recording, high-sensitivity performance and maximum image quality. Smart portrait system: advanced automatic features for perfect portraits. Smile Timer takes a series of shots at 6 fps when your chosen subject smiles. Blink Proof alerts you when someone had their eyes closed. Skin softening adjusts uneven skin tones on people’s faces for smoother looking skin. In-camera Red-eye Fix corrects false eye color due to flash the instant you take the shot. 18 scene modes automatically optimize settings for popular photographic styles, effects and locations.